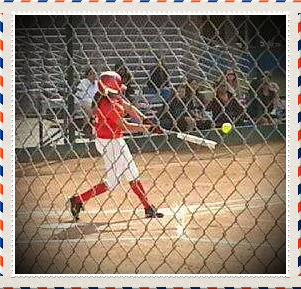 Huge Congratulations to Caitlyn Koenig who has taken the Softball tournament scene by storm to start this summer. Last weekend Caitlyn played a vital role in the success of her club team (Corona Angels) over a 7 game tournament stint in Denver, Colorado. She batted .700 with an on base percentage of .850, and 4 home runs. In addition to the success at the plate, Caitlyn was equally impressive behind the dish and threw out several base runners. Caitlyn attributes much of her recent success to the confidence, and strength she has gained in just a few short months of working at Champion’s QUEST. She has been very diligent with her training and nutrition regimen. She is an extremely talented young ball player, and I am REALLY excited to see how she will continue to progress as she puts in the hard work! Katya i s a 17 year old softball pitcher who has been coming to Champion’s quest since March of this year. Katya came to us straight off of an ACL tear that occurred during a softball game, with the goal of getting back to being the athlete she knew she could be. Within 5 months she went from struggling to get through body weight squats and balance drills, to running a 20 yard dash in 3.06 seconds, and jumping 19 inches! Katya has exceeded almost every goal she has set for herself thus far, due to her hard work and her passion to get better. 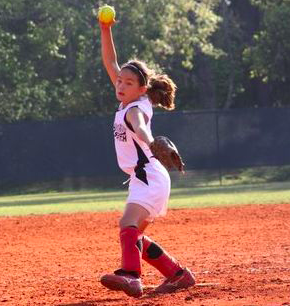 She has put in multiple hours a week training here, doing both privates and clinics, as well as practicing with her team and taking pitching lessons. Not only is she dedicated to her physical game, but her mental game as well. Coming off of an injury she had lost a lot of confidence and was not sure that she get back to where she wanted to be as an athlete. Training at Champion’s Quest has given her confidence, coaches to talk to who understand her struggle, and a huge support system that has allowed her to accomplish more than she thought possible. Her remaining goals involve bringing h er high school team to victory in the post season, continuing to improve her mental game, and earning a starting spot when she goes off to play in college. At the end of this school year, Katya will graduate and move to Ohio to get her degree and play softball for the Ohio State Buckeyes. We are all so excited and proud of her. I can’t wait to see what great things she will accomplish at Ohio. I have had the privilege of working with her for the past 8 months, and am excited to push her to reach a few more of those goals before August! Great job Kat!! Alyssa Aburto is a 14 year old softball player here at Champion’s Quest. Alyssa has been training with us for 6 months with the goal of increasing her speed, becoming a more powerful athlete, and improving her mental game. Alyssa’s ultimate goal is to get a scholarship for softball and study oceanography. In Alyssa’s 6 months her she has worked hard and made great improvements. Her biggest improvements have been seen in her foot speed and upper body strength. Her agility scores have all become 2-3 seconds quicker and she went from being able to only do 6 push-ups to completing 25 in our last session. in addition to these numbers, Alyssa has seen success in our athletic clinics here, as well as on the field. Alyssa plays travel softball for a very competitive team and was a force everytime she was in the box, or out in the outfield. We are all looking forward to seeing Alyssa grow even more here at Champion’s quest! To reach these goals Alyssa came to strength, acceleration, and intensity classes, switching off every week. On top of that she put in extra time for training and conditioning with her travel ball team. This has not been an easy road though. She has had to push herself in every class, improve her diet, stay hydrated, and make sure that even when she wasn’t here she was staying active. It has paid off for her and will continue too! Alyssa is a great athlete and great positive energy to have here at Champion’s Quest. Great Job Alyssa, and Keep up the good work! As athletes we sometimes forget that on days we aren’t competing it is still important to eat and drink healthy. Fueling yourself with food and drinks high in artificial products and with greasy fast food will cause your body to crash and feel fatigued. By staying hydrated and giving your body healthy foods before and after competition you can stay mentally and physically energized throughout your season. There are ways to help prevent injury both before and after competition. During workouts on non-competition days make sure that you are using proper form for all of your exercises. Doing so will keep joints and muscles more mechanically sound during actual competition. Before workouts and competitions make sure you are fully warmed-up. By increasing heart rate and raising your body temperature you are increasing blood flow to active muscles, preparing them for action! After workouts and competitions it is extremely important to do a cool down, stretch, and ice if needed. Doing a cool down (low intensity exercise to gradually decrease heart rate) is very important for high intensity sports like lacrosse where heart rate stays high through out competition. Stretching and icing will help prevent soreness and aid with small aches and pains that can come about during season. By recognizing these small aches we can keep them from turning into big pains! It is important to continue your exercise program throughout your season, but you have to be smart about it! Knowing when your next competition is is key to knowing what type of workout you should do. The last thing you want during an intense game is to only be able to think about how sore you are! When working out 1 to 2 days before competition lighten up on the amount of weight you do, avoid trying new intense exercises, and lower the volume of plyometrics and sprints that you do. Also make sure that you give your body the rest it needs; that includes getting a good night of sleep! A happy body equals a happy athlete! It is easy to remember to take care of our bodies but we forget that our minds need just as much care! You can give it the care it needs by keeping your mental stress in check. Give yourself time before and after competition to clear and refresh your mind. This time can consist of positive visualization, meditation, reading your favorite book, or anything thing else to help you reset and refresh your mind, if even for a few minutes. This is especially important after a bad play or a bad day. Take a moment to reset and stay positive so that you are ready to succeed at the next opportunity you have. Using these tips will help your body and mind stay in top shape throughout your season! 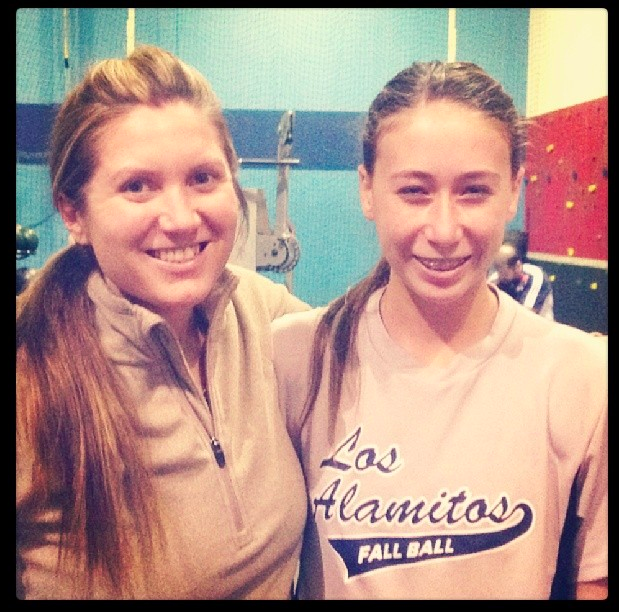 Skylar F, a local softball athlete playing for Los Alamitos Girls Softball League and All-Stars last Summer has been training with Coach Meggan for the past six months. When Skylar first came in for sports performance training, her main goal was to increase her strength and speed on the field. Working on footwork, strength, body control, quick feet agility, rotational power, and skill development, Skylar’s program focuses on developing multiple elements of the game. Power training for speed out of the box, injury prevention such as core training and knee stabilization. perfecting her running technique, and agility has helped Skylar improve her score by over 500% in the past six months. Coach Meggan shares that, “Skylar has been coming in twice a week working very hard. I look forward to her sessions because Skylar works to improve each session. She is the kid that will not leave a day without knowing that she did extra work to learn and improve. Coordination and agility training is something that Skylar has trouble with and instead of giving up as some athletes I have seen, she digs in and works harder and harder. She continues to develop her mental focus as well.” Skyler shares that her main goal is to continue to improve her speed and compete in college. Skylar says, “I get better every time I come here and now I have learned how to really push myself.” Congratulations Skylar! Keep up the hard work. Some of Skylar’s accomplishments are shown below. In her past 9 months here at Champion’s QUEST, Hailey McCann has set new records! She is the first female athlete ever to reach our CHAMPION level. Some outstanding improvements include increasing her approach vertical by 6.5 inches to a 25.5 inch, taking 4/10 of a second off both her 5-10-5 and 40 yrd dash tests, and completing 65 push-ups in 60 seconds from her original 20. Hailey, a Junior at LB Poly, will surely be leading the Jackrabbits to a great year! Congrats Hailey on your huge improvements can’t wait to see how much you improve in the next quarter! In the past three months, Megan Geer has made great improvements! Megan, a softball player with Los Alamitos High School, has improved her vertical by three inches in a short three months. She has also been clocked at running a 1.51 10 yd and 4.95 40 yd sprint which has put her on the leader board for records set here at Champions QUEST. By practicing discipline and consistency with her training, Megan has experienced these amazing improvements in her power and speed. We look forward to seeing Megan continue to improve as she also serves as a great example for our community of athletes. Congrats Megan on your huge improvements can’t wait to see how much you improve in the next quarter!